As an alternative to special barcode printers, printing onto A4 sheets of paper labels using existing conventional printers may be preferred. We specialise in 2 Worth Data products, 'Labelright for Windows' and 'Barfonts for Windows'. We have sold these packages over the last 9 years to all types of organisation and know them to be feature-rich and excellent value. 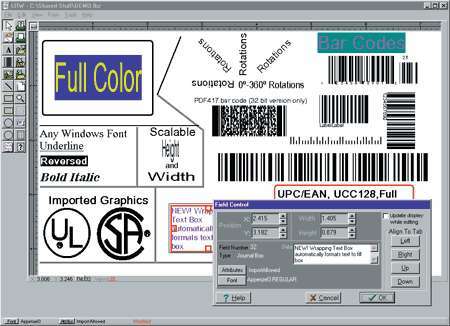 Labelright is Windows based label design software that is typically used on laser, inkjet or dot matrix printers. On lasers and inkjets very often you would print onto pages of 'avery-type' A4 label sheets. It has all sorts of design capabilities including graphics, database import, auto-incrementing and so on. Like all Worth Data products, it is supplied on a 30 day no-quibble refund guarantee. A demo is available on the Manufacturers Web Page. Although the normal price is £206, we can supply it for £127 (no delivery charge for 3-4 day delivery). Alternatively, Barfonts is a package that allows inclusion of barcodes into other windows applications where a host of barcode fonts become available alongside all your normal windows fonts. It also includes programmers libraries for those who want to translate and print their application data as barcodes, seamlessly from within their programs which might for example be developed in Access, Delphi or Foxpro. For full information please visit the Manufacturers Web Page. The price is £139, again no delivery charge for 3-4 days, and a 30 day refund guarantee. We can also provide pre-printed labels of all types, even including metal barcode tags that can be fixed using rivets or adhesive. The BCM3000 is a small, compact unit capable of attachment to all standard laser, matrix and ink jet printers which transforms them into powerful bar code and labelling printers. Normal printer operation is not affected - BCM3000 simply extends the printers capabilities to include bar codes, scalable text, line & box drawing. 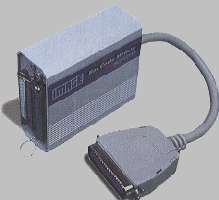 With both parallel and serial interfaces in the same unit, BCM3000 connects to systems ranging from PCs to mainframes.